For many years I have been trying to expand the boundaries of classical music to the widest spectrum of listeners. Also, I have tried taking a new approach towards things which have been surrounding us for centuries. That is why I asked the best violin maker in the Czech Republic Jan Špidlen (www.spidlen.cz) to build a violin for the new milennium. 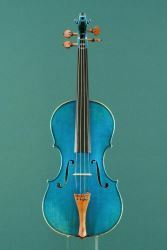 - Violin maker Jan Baptista Špidlen. - The wood comes from the old family timber stock of the maker´s grandfather Otakar F. Špidlen, it was about 50 years old and originated from Bosnia (maple) and Dolomits (spruce). - Profile with shorter corners, narrower and thinner ribs, slightly bigger f-holes, plumbs embedded in the scroll – all for enhancement of sound. - Titanium screw inside the nose of the neck – adjustable preload against the malformatiom caused by time or climate changes. - Carbon fibre on the bass bar for extension of durability. 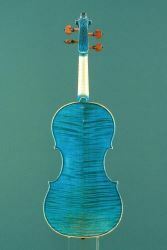 - Scroll - purely esthetic part of the violin, where the violin maker can apply his artistic ambitions. The author stuck to the traditional spiral. - Blue color – on my request, a new approach versus tradition, a symbol of rebellion against rules and conventions. 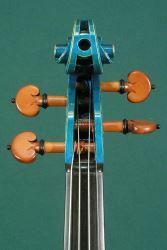 I first introduced this amazing instrument to the public during the 2006 Dvořák Tour.